Bessie Magombo gently leaned against a mango tree that provided a convenient shelter to enterprising women who are turning things around in Traditional Authority (T/A) Kaduya in Phalombe District. It was a hot Thursday afternoon and she actively followed proceedings on strategies to improve their livelihoods. At 19 years, she is the youngest of 35 members of Madalo Community Savings and Investment Promotion (Comsip) Cooperative, with some members probably the age of her grandmother. Finding herself in a group devoid of her age-mates does not bother the Form Four learner at Ngozi Community Day Secondary School. She has started her road to entrepreneurship, embracing the savings-first approach of setting aside any amount of money before any expenditure is done. “I want to be an entrepreneur, a successful business lady. I am sure that one day I will create employment opportunities for others in this village,” Bessie states positively. Members of the cooperative, which is intermediating about K2 million to them, derive their livelihoods from different income-generating activities made possible through their savings. Just like all other Comsip groups, which, as of June this year, have cumulatively mobilised K6.64 billion since 2014, members of Madalo Cooperative are encouraged to save in three vehicles of mandatory savings, voluntary savings and share purchase. Bessie understands that, generally, low income individuals in her area have low propensity to save, a habit that cannot generate enough to invest in productive activities. She envisages that by pooling savings as a group, they will eventually accumulate large amounts which will be invested in diversified but productive group and individual business activities such as piggery, poultry, legume production, irrigation farming, bakery, honey production, rice farming and vegetable farming. Through the savings and lending, Bessie and others have been able to start their individual income-generating activities through which they are assisting their respective households through improved food security, health and adult education, among others. Recently, Comsip Cooperative Union supported members of Madalo Cooperative with a grant of K800,000 under the Nutrition and Health Micro Project whose aim is to improve nutrition, health, sanitation and hygiene of member households. Bessie undertook the challenge of accessing the funds. She got K22,000, like other members of the cooperative. With this money, she bought five chickens as an investment and set up a backyard garden with the appreciative thinking that the state of nutrition and health of members and their households is paramount. Today the chickens have multiplied and Bessie owns a large flock which she expects will earn her a decent income and support her education needs in her pursuit to being a successful entrepreneur. And she does not sing the sweet song alone. 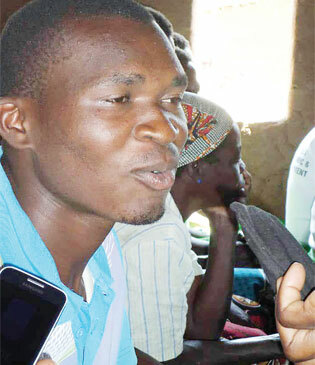 Twenty-one-year-old Jairosi Elia of Group Village Head Chalunda in T/A Kambwiri, Salima District, has also had his dream for good education rekindled. At 15 years, he dropped out of school in 2012 while in Form Two. “My parents couldn’t afford school fees or any other support to meet the cost of my education, be it exercise books and uniform. I, therefore, dropped out of school. I saw my future crumbling in my face. I have always had an ambition of becoming an accountant,” Elia says. After some years of fruitless attempts to secure support for his education, Elia turned to rocks. Yes, rocks, once a hindrance to productivity in the arable land, became an asset for him. He made a few heaps of quarry stones and took the proceeds to buy shares in Mkombe Comsip Cooperative in Salima which became his lifeline after he borrowed K50,000 which acted as a launch pad into trading into plastic wares business before venturing into farm produce. “With K50,000, I bought 100 plastic washing baskets. I sold them at K250,000. I invested K100, 000 in agro-dealer business. I buy agricultural produce which I sell during the lean period,” Elia explains. The profits made from the sale of the produce enabled him to enrol again in school where he self-sponsors all expenses such as school fees currently pegged at K70,000. “Today, I am in Form Four at Mzinza Mission Secondary School in Kasungu District. I comfortably finance my own education because I earn enough profits from my business which has its roots in the cooperative. I also look after the needs of my parents,” Elia declares. Elia credits Comsip for capacitating him and 23 other members with training including financial literacy, business management and environmental and social safeguards. Comsip supported Mkombe Cooperative with a training grant which also acted as seed capital for the group. The union’s initiative of savings and investment is unleashing the potential of youths and directly responding to the African Union Agenda 2063, which emphasises the need to harness demographic dividend through investments in youth and women. According to the Malawi Growth and Development Strategy (MGDS) III, the youth under 30 years, such as Bessie and Elia, constitute about 70 percent of the population, entailing that the country needs to capitalise on the demographic dividend where the youth will help accelerate economic growth through increased productivity in the job market. This should be done through youth participation in decision-making, employment creation and opening up opportunities for them to engage in businesses, MGDS III says. Perhaps it is time to nurture the youth with entrepreneurial skills with the Comsip concept to improve their livelihoods.